If you took your map of Spain and threw it into a tub of water, the shrunken version that would emerge would likely to be an accurate representation of Castilla y León. 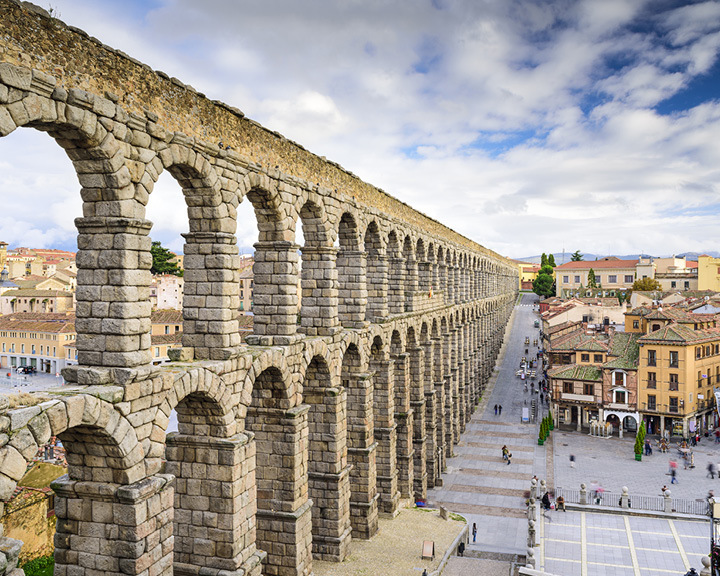 A sprawling land of ancient Spanish kingdoms, dotted with beautiful towns, each with its own castle and cathedrals, Spain’s largest region follows the national boundaries surprisingly closely, lying just northwest of Madrid. 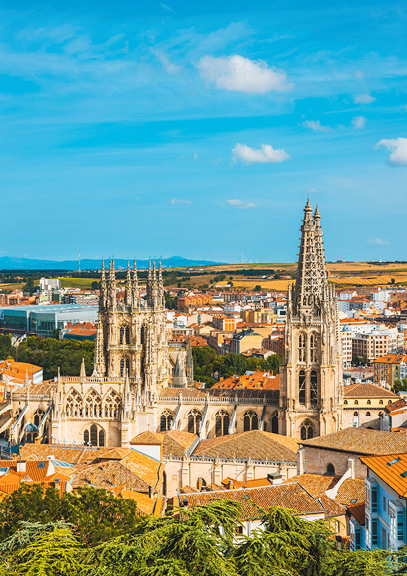 Castilla y León can claim to be the true heart of Spain, for this is where the great Catholic monarchs Isabella of Castile and Ferdinand of Aragon united their kingdoms through matrimony in 1469 and subsequently launched the Reconquista to reclaim the country from the Moors. 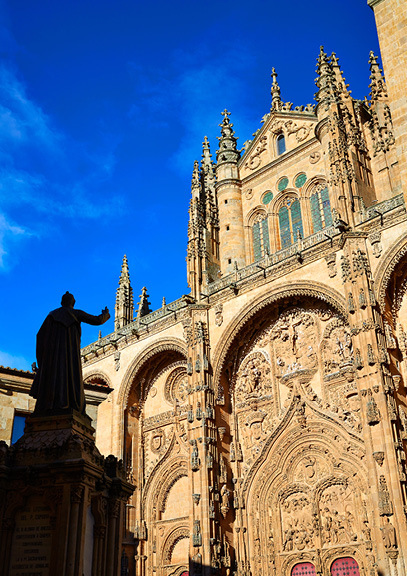 It is also where Castilian, the purest form of Spanish, is still spoken, and where the world comes to study Spanish at the 800-year-old University of Salamanca. 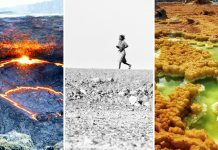 The region’s superbly rich culture and history are matched by an equally marvellous gastronomy fed off the vast fields of wheat and barley, sprawling pasturelands where cattle and pigs roam free. Castile and León (alternative name) also boasts some of the finest wine regions located in the valley of Duero River that cuts through the region from east to west. Our first stop was the walled city of Ávila with its imposing fortress-cathedral built on a low plateau. We lunched in a local tavern called Alcaravea, situated on the first floor overlooking the plaza. The first course was alubia blancas, a thick white bean soup with bits of bacon thrown in, followed by patatas revolconas (mashed potatoes) flavoured with paprika and garnished with crispy bacon. I was not a big fan of either dish because it felt like rajma (red kidney beans) and aloo (potatoes) jazzed up with meat, but no spices. The pièce de résistance was yet to come: the chuletón de Ávila, a magnificent T-bone beef steak. The meat cut easily off the bone, and it was perfectly cooked and succulent. Washed down with a robust red wine from Ribera del Duero and topped off with a delicious tarta de queso (cheesecake) with blueberry coulis, this was a grand start to our culinary tour. My first sight of Anselmo Pérez brought a matador to mind. He stood proudly in his uniform, behind what looked like a dying bull, his espada (sword) at the ready to administer the death blow. But the beast was only the cured loin of a pig gripped firmly in a metallic stand that looked like a torture device. The uniform was a tunic emblazoned with the words ‘Champion Ham-cutter of Spain 2011’, and the sword was a jamonero, a special Iberian ham-cutting knife. Ironically, Anselmo the cortador (ham-cutter) was a slight man with thinning hair and the gentle demeanour of a priest. He reminded me of the Spanish footballer beloved of Indian fans, Andrés Iniesta, and he smiled as if to say he had heard that before. We had been invited to lunch at Anselmo’s speciality restaurant Corte&Cata (‘Cut and Taste’) in the grand old university town of Salamanca, where we were about to be initiated into the fine art of curing and cutting ham. Anselmo showed us some videos about the pig-to-ham process, and I was blown away by the level of detail and passion for something seemingly so banal. The huge, black Iberian hogs snuffling away for acorns in the oak forests of Salamanca set to a disco-fied version of Phil Collin’s Dance into the Light had us hooked. He then walked us through the process of curing the ham, which is no less complicated than making wine. After three or four months of a charmed life, when the animals roam free-range and double their weight, comes their day of ‘sacrifice’, which means slaughter but implies a whole different level of respect that Spaniards have for their pigs. The hams are then salted for about a week before being rinsed clean, and then begins their journey through a series of cold rooms, drying rooms, and finally bodegas or cellars where they age for at least two to five years. The final step was when Anselmo inserted a sliver of polished bone into the cured ham and held it up to his nose, sniffing for the perfect aroma, just as a sommelier would sniff a wine cork. After all that theory, we were salivating at the prospect of a tasting. Anselmo and team did not disappoint. Deftly slicing off wafer-thin pieces of ham, they artfully plated them in spinning-wheel designs and placed them before us. 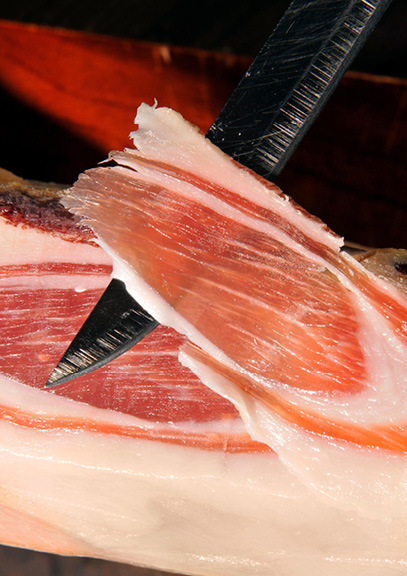 The crème de la crème of Spanish hams is jamón ibérico de bellota, or ‘ham from the acorn-fed free-range black Iberian pig’. One bite and you knew you were in the presence of greatness. Like an extremely fine wine, the sweet, nutty and not too salty flavours intermingled, while the fat melted in the mouth, releasing the fine oils of all those acorns. We sampled several other types of delicious jamons, chorizo (pork sausage spiced with paprika) and lomo (pork tenderloin) until we were stuffed like the pigs themselves. The very best Iberian jamon doesn’t come cheap—it starts from INR 42,350 and go up to as much as INR 3,31,775 per kilo, depending on the brand and the vintage. As we were preparing to leave, I asked Anselmo the question that had been burning inside me: what does it take to be the champion ham-cutter in Spain? His answer: superb hand–eye coordination, a serene and focussed disposition, an obsession with perfection, and the one that was lost in translation, an impeccable righteousness. So the man was a priest, after all. The meal we were all looking forward to was the dinner at a Michelin one-star restaurant in León, the gastronomic capital of Spain for 2018. Called Cocinandos, a play on the Spanish words cocinar (to cook) and dos (two), the restaurant is the creation of two young chefs, Yolanda León and Juanjo Pérez. After an apprenticeship spanning some of the best restaurants in Spain, they decided to open their own place. In doing so, they brought in three innovations to the traditional, stuffy world of León cuisine. They made the decor very minimalist, yet elegant, in the Japanese style so that diners could concentrate on the food; they kept the kitchen open-plan so that patrons could see what was being cooked; and they only have one tasting menu (for INR 3,530), which changes every week depending on the ingredients available in the market so that the dishes may be fresh. The tasting menu that Juanjo and Yolanda treated us to can only be described as an explosion of taste and sensation. Could food look and taste this good? We started with an exquisite baby artichoke and quail’s egg stuffed with Iberian ham, followed by a delicious asparagus soup infused with marinated trout, roe, and Béarnaise sauce. Then came the unique cured meat layered with apple, tomato, and goat cheese, and the steamed mullet accompanied with rice, peas and codium seaweed. The finale was a puff pastry delicately stuffed with pineapple, coconut, and toffee. 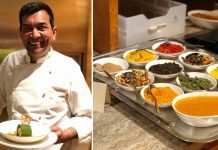 The dishes were all complemented by wines—an aromatic white, the award-winning K-Naia 2016 verdejo and an intense Belote Bodegas red coming from the prieto picudo grape local to the region. Juanjo came out from his kitchen to receive a deeply appreciative ovation from our group, a motley mix of nationalities. One Michelin star is usually awarded to places that are worth visiting if you’re in the area, and we all agreed that Cocinandos thoroughly deserved that accolade. No discussion of gastronomy can be complete without talking about wine, of which Spain is the third-largest producer in the world. The history of wine-making in Castilla y León dates back to the Roman Empire, but the modern tradition of viticulture was introduced by the Benedictine monks from Burgundy in France in the 12th century. These monks came to Spain as part of a resettlement drive when the newly victorious Catholic monarchs offered the land that had been reconquered from the Moors to new Christian settlers and monastic orders. 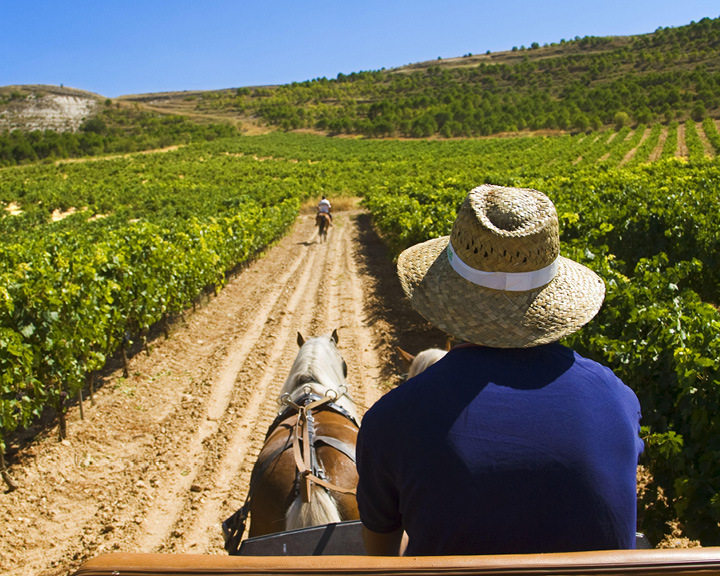 Currently, the region has nine denominación de origen (‘designation of origin’) wine regions in Spain from where some of the highest-quality wine is produced. We sampled several excellent selections from Ribera del Duero and Rueda, the best-known wine-growing regions here. Grape cultivation is supported by the Duero, which cuts through the high, dry plateau of the Iberian peninsula. A continental climate with temperature extremes helps the ripening process, with the stony soil rich in iron and lime with good drainage. When one thinks of Spanish wine, Rioja immediately comes to mind, but I found Ribera del Duero to be a highly competitive alternative, with robust red wines that are more concentrated in colour and richer in tannin. These wines are almost all made 100 per cent from the most well-known Spanish varietal Tempranillo and paired very well with all the varieties of cured meat we had along the way from the classic jamon to the spicy chorizo. The wines of Ribera del Duero are classified into four categories—jovan, crianza, reserva and gran reserva—depending on how long they have been aged and how much of that time is spent in oak barrels, and accordingly range in price from INR 350 to INR 35,000. While Spain is known for its reds, there are also some world-class whites produced in Castilla y León. They have a shorter history, dating back to the post-Franco era when the most famous of winemakers from La Rioja, Marques de Riscal, led the way in improving the quality of whites with the introduction of new technology featuring stainless steel and temperature control. The dominant white in the region is Rueda, the primary varietal going into it is verdejo to make a very aromatic white wine with a refreshing acidity. We found this to pair really well with the fine seafood and the Manchego cheese (made from sheep’s milk). Rueda also offers tremendous value for money, and even the most expensive bottle does not exceed INR 3,530. Don’t forget to pick one up on your next trip to Spain! 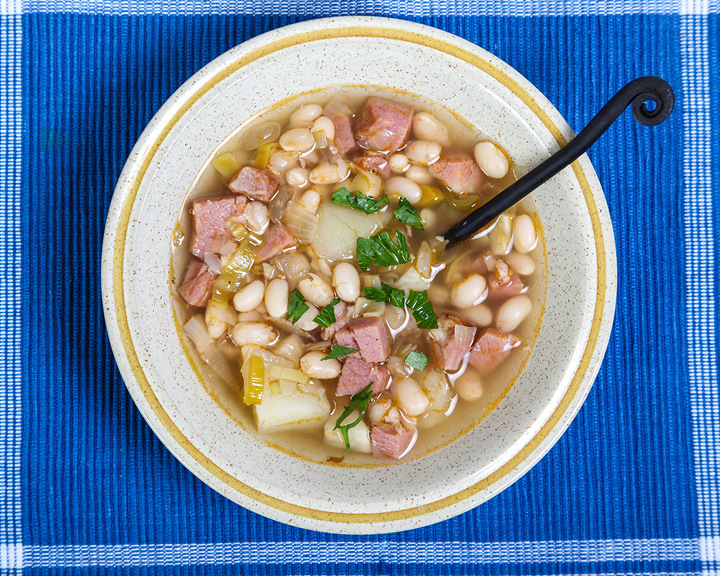 The region of Castile and León offers food as pure and organic as the language of its locals. Sample these offerings to get a taste of Spain’s vast array of gastronomic offerings. Air India operates the only direct flight to Madrid from Delhi. Other major Indian cities are connected by Qatar Airways, Etihad Airways, KLM, etc. through their global hubs. From Madrid, the major cities of Castilla y León (Ávila, León, Salamanca, Valladolid, and Zamora) are reachable by high-speed train in one to two hours (renfe.com). Hospes Palacio de Esteban is a five-star luxury hotel that occupies an old Dominican convent in Salamanca. Doubles from INR 8,000. Similarly, in Ávila, the Parador de Ávila has been converted from the old Piedras Albas palace, and backs on to the famed city walls. Doubles from INR 9,000. Hotel Sercotel Alfonso V combines a classic style with modern facilities, just a short walk from the historic heart of León. Doubles from INR 7,000. Alcaravea is a tavern in the heart of Ávila. Try the local speciality chuletón de Ávila. INR 3,000 per head. When in León, do not miss Cocinandos. INR 4,000 per head. 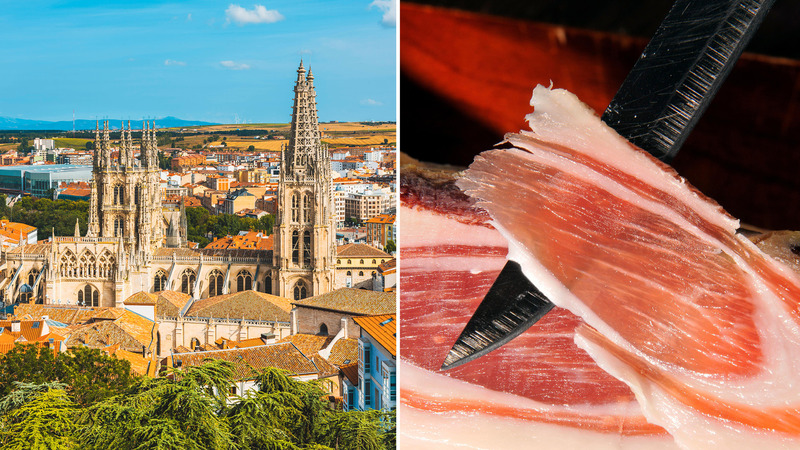 To sample the finest Iberian ham, check out Corte&Cata in Salamanca. From INR 3,500 per head for set menus. There are no gastronomic tours of Castilla y León, but it is a great destination for wine tourism. Follow one of the six defined wine routes (turismocastillayleon.com). It might be best to devise a customised itinerary combining wineries and restaurants with a specialist luxury travel agency like Terra Traditions.